I teach in a small undergraduate English department where each faculty member covers a range of courses. As you can see in the listing below, I teach courses in Old English, Middle English literature, studies in medievalism (primarily Tolkien’s fiction), writing, women’s literature, poetry, and classical literature as well as a range of texts in introductory courses. Occasionally, I have the opportunity to supervise students writing an Honours thesis or to conduct directed study (independent study) courses. Below you will find links to the courses that I will be teaching in the 2019-2020 academic year. As an adjunct in the graduate English program at Dalhousie University, I have had a few opportunities to teach graduate courses there or to serve on dissertation committees. These activities are also listed below. “From a Corpse to a Life: The Body in Old English Hagiography.” 2001. M. Fast. “‘May Saracens Be Saved’: The Conversion of the Saracens in Chaucer and Langland.” 2007. C. Bailey. “‘Woman, why weepest thou?’: The Influence of Mary Magdalene on The Book of Margery Kempe.” 1999. K. Berrigan. “Noisy Links and Narrative Energy in Chaucer’s Canterbury Tales.” 1995. V. Creelman. “Forging Faërie: Sub-creation, Depth and Mythic Otherworldliness in J.R.R. Tolkien’s Conception of the Fairy-Story.” 2011. J. Deschenes. 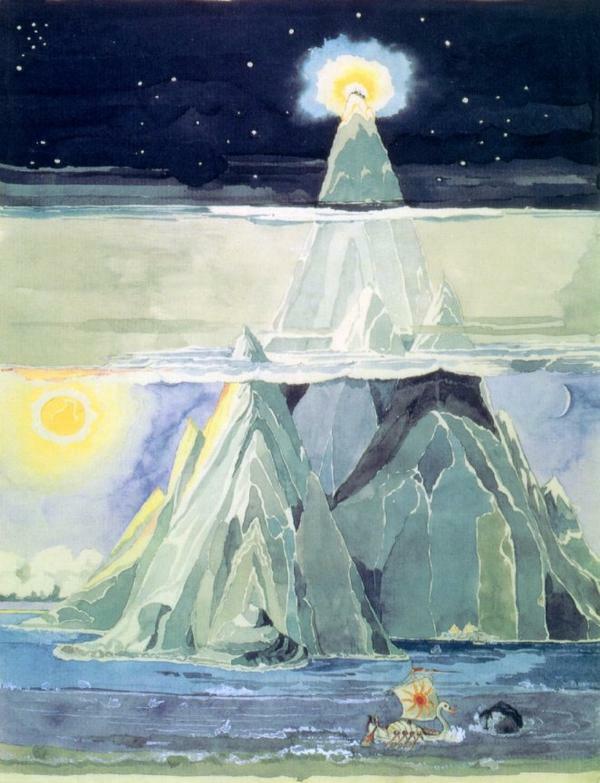 Image: The image on this page is a detail from J.R.R.Tolkien’s painting Halls of Manwë (Taniquetil), published in J.R.R. Tolkien: Artist and Illustrator by Wayne G. Hammond and Christina Scull. It is also widely available online.